Fritz Nöpel (* November , 1935 in Breslau) is a German Karateka and the pioneer of Gōjū-ryū-Karate in Germany. He is the recipient of the 10th Dan and the honorary title of Hanshi from Japan as well as the German Karate Association. 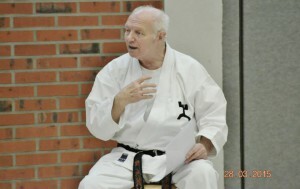 Fritz Nöpel explains various Karate-related topics during a seminar in March 2015 in Ochtrup. Photo: Yuishinkan Dojo Ochtrup. In 1954, following his apprenticeship as a miner, Fritz Nöpel startet a bicycle trip from Dortmung, Germany, through all Europe, the Middle East and all through Asia. His aim was to visit the Summer Olympic Games 1956 in Melbourne, Australia. In Java he first came into contact with Karate. The first intense karate lessons he took in Taiwan. After a first visit to Japan in the winter of 1957-58, he graduated as a deep sea diver in the United States and subsequently worked as a professional diver in Japan. There he began to learn Gōjū-ryū as one of the few students in the Yuishinkan, the dōjō of Kisaki Tomoharu in Ōsaka. In 1961 he married Eiko Nakabayashi in Ōsaka. With his wife Eiko and daughter Jaqueline he returned to Germany in 1967, where he worked for the German Federal Railroad as a surveyor until his retirement in 1996. Since 1982 he lives in Kamen. Together with his wife Eiko he has five children. In 1967, Fritz Nöpel – then owner of the 4th Dan – established a Gōjū-ryū-Karate-department within the Police Sports Club Dortmund. This was the first Gōjū-ryū-Karate-dōjō in Germany. Shortly after his relocation to Kamen 1978 he founded the Karate-Dō Club Kamen, which to this day is the Honbu dōjō of the Yuishinkan in Europe. 1999 Fritz Nöpel was awarded the 8th Dan and the honorary title of Hanshi. In 2007 the German Karate Federation (DKV) awarded him the 9th Dan and in 2016 the 10th Dan. Fritz Nöpel is Honorary Chairman of Gōjū-ryū Karate Federation of Germany as well as of the European Gōjū-ryū Karate-dō Federation. He was also instrumental in the development of the the German Karate Federation (DKV). Yuishinkan (唯心舘, Hall of the Brave (sincere) heart) is the name of a dōjō in Osaka, Japan, and an undercurrent of the Gōjū-ryū karate-style with the greatest circulation in Germany and Mexico. Yuishinkan was founded in 1953 by Kisaki Tomoharu. 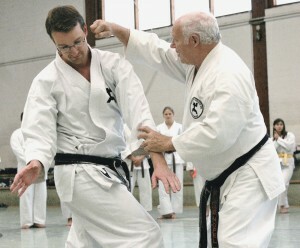 Fritz Nöpel began his practive in 1958 as one of the few students to learn Gōjū-ryū Karate at the Yuishinkan. The Yuishinkan was known for its hard and heavy stamina training and has some special features, such as the close-combat Kumite-ura (in which the attacker wins) and the Nage-waza (throws, foot sweep and levers), both introduced by Kisaki. The Yuishinkan also has its own dōjōkun and even a song, the Yuishinkan no Ka, in the text of which devotion to practice at the dōjō is expressed. After Kisaki’s passing in 1996, Nagoya Shigeru and Nakayama Norichika took the lead. The logo of the Yuishinkan is a stylized dragon. It is also in accordance with the family emblem (mon) of an old noble family of Ryūkyū (Okinawa). The symbol is well known all over Germany. Kisaki Tomoharu set five rules as the dōjōkun. Practice with proper manners and etiquette! Ralf Budde (l) and Fritz Nöpel, Sepai no Kenkyu, in Witten 2010. Every two years the International Gōjū-ryū Karate-dō Yuishinkan Kata seminar is held in Japan. Every other year the International Summer Course takes place in Kamen, Germany, with hundreds of people attending so that the number of attendees had tob e limited to 500 some years ago. In 1997, Fritz Nöpel and his son in law succesfully participated in the 1st World Karate Kobudo Tournament in Okinawa, with Christian placing 3rd in the open class full contact category. An old time student of Fritz Nöpel went to Japan with the Transsiberian Railroad, and subsequently entered Okinawa, where he became the owner of various jewelry store on Kokusai-doori. I was told by credible sources he was termed the King of Okinawa. The Miyagi and Higaonna monument at Matsuyama Park in Kume was planned, managed, and set up by Yuishinkan founder Kisaki Tomoharu, with the financial help of many concerned with Gōjū-ryū. In recent years, Fritz Nöpel focused on the Jukuren training and published a book on this subject together with Martin Nienhaus and developed the Jukuren no Kata, a kata specifically designed for older people. Note: This article is a translation of two German Wikipedia entries on the subject. Photos by Ralf Budde and the Yuishinkan Dojo Ochtrup. © 2015 – 2018, Andreas Quast. All rights reserved. This entry was posted in Misc, Unknown Ryukyu and tagged Fritz Nöpel, Goju-ryu, yuishinkan. Bookmark the permalink.